I say everyday is a good day for a salad, but a special celebration deserves a little extra thought and preparation. 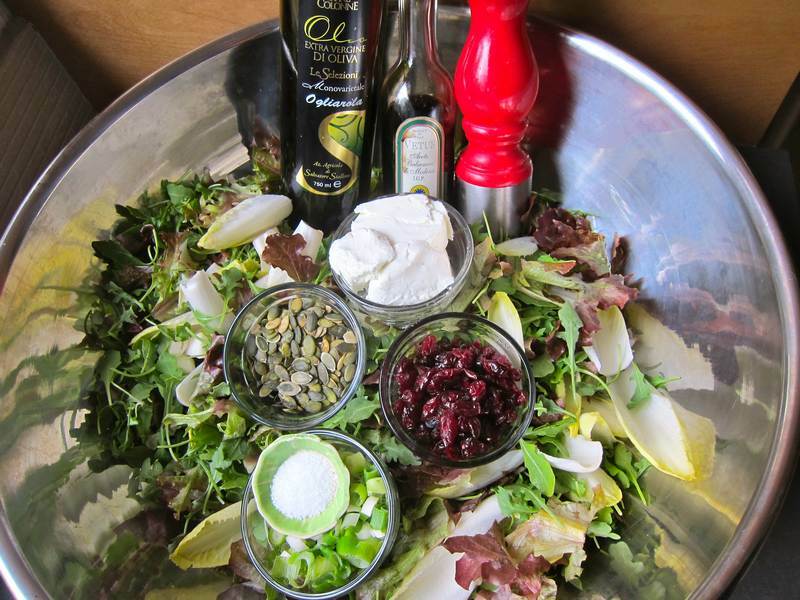 The sweetness of the cranberries in this Special Occasions Salad is tempered by the tartness of the vinegar. Bitter greens, sharp scallions, smooth cheese, crunchy nuts—This salad is a study in contrasts. Oh, and it’s healthy too. In a small saucepan, combine cranberries with vinegar. Bring to a boil over high heat, then set aside to cool to room temperature. Just before serving, combine greens and scallions in a large bowl. Season with salt and pepper. Add olive oil, cranberries and vinegar, tossing well. 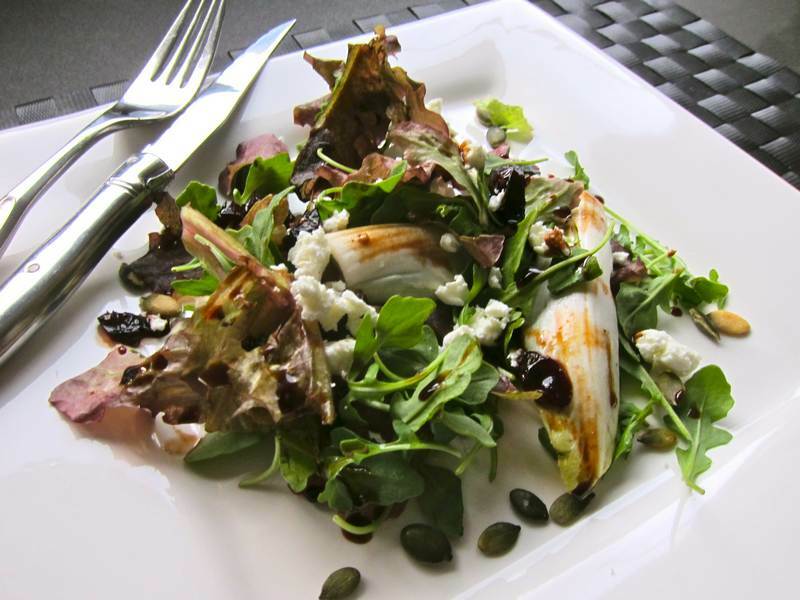 Serve each portion topped with crumbled goat cheese and sprinkled with pumpkin seeds. Serves 8. Inspiration for this salad came from Oprah. Remember her? Would you believe me if I told you that there are 48 Jittery Salads? 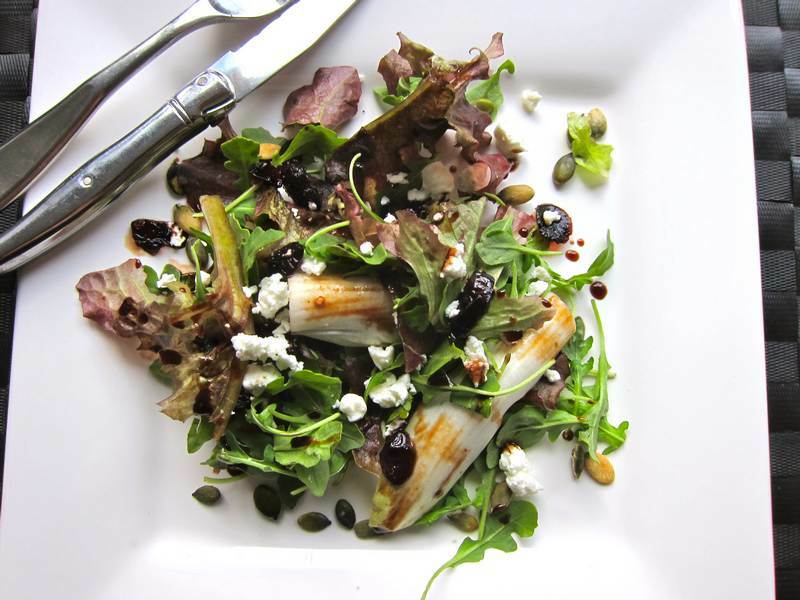 Here are 29 more healthy fall salad recipes. Do you suffer from kale curiosity? You must watch the documentary The Botany of Desire. You will be amazed. Looking for something interesting? Check out Jimmy Nelson‘s 46 stunning photos of vanishing tribes. I’m thinking about Popexpert Mikaela Reuben and her 90 second health coaching tip. She looks like a nutrition goddess to me. Thanks. I love trying new things and really love keeping track on Jittery Cook so that I have easy access to dishes that taste great. This blogging business is revolutionary! Thank you for the link to Jimmy Nelson’s photograph. They are spectacular. I also watch the video that is after the photos and it was quite interesting. You know me. If I find something fascinating I have to share. Live and learn! Beautiful salad. This would make an outstanding first course for company. Impressive. Thanks Jovina. Really hard to photograph well. It’s even more beautiful in person! I love fruit in my salads, and this one sounds amazing! Thanks! Love your Mac and Cheese. One of these days we’ll dine together.